Container App e.g. 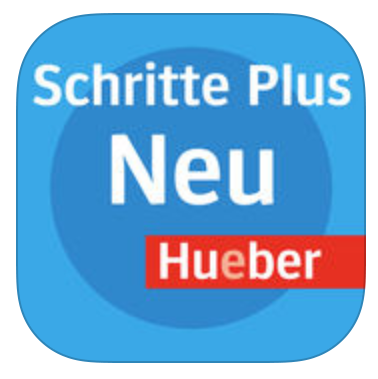 "Schritte Plus Neu"
The app does not recognize my book pages. What do the different characters in File Manager mean when I type on the small gear in camera mode? One AR app for all levels. We have combined all our augmented reality (AR) apps in new container apps. There are separate apps for each country: Germany, Austria, Switzerland and Italy. With our new apps it is no longer necessary for you to keep a separate app on your device for each level. We recommend that all users of the following apps delete them from their devices and download our new container app in their country edition. With this app you can use all our AR capable books. The individual apps are no longer available in the app stores. What are the minimum system requirements for smartphones and tablets to use the AR App? That can have different reasons. Here we name the most common and possible solutions. Lack of lighting: Make sure you have good lighting conditions. Better too light than too dark. Too close or too far away from the book page: The app must always "see" the complete page. So keep the smartphone away enough for the camera to capture the entire page. Generally, pages containing images are detected faster and faster. For pages with few images, it is important to always capture the whole page. The camera should always capture the page head-on. Hold the smartphone parallel to the book page. You can also make sure that the book page is as flat as possible. Notes and highlighting added to the book: Highlighting, notes and markings interfere with the AR app’s recognition of the page. Please avoid these. Only make entries in the book in places where you are instructed to do so, and use a fine pencil. .
You can also access content through alternative media access. This is now available for the latest version of "Schritte plus Neu" and "Mein Leben in Deutschland". All new apps will also be equipped with this feature. 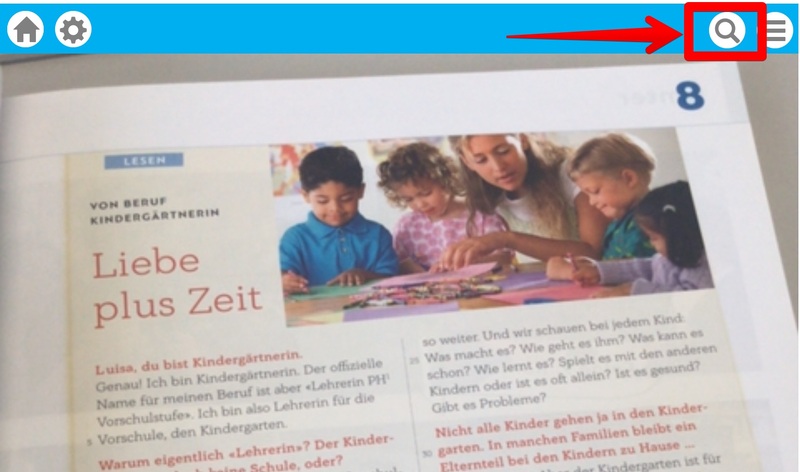 If a book page is not recognized automatically by the app, you can click on the magnifying glass in the top right corner and a window with a media selection opens. In the media selection you can then enter the page number (Fig. 1) from which you want to load the contents. You can use the filter function to reduce the results on certain media (Fig.2). Example: Here, all the audios on page 10 of the workbook were filtered. After confirming the selection, by clicking on Enter on the keyboard, then all found media are displayed and can also be played immediately. A blue down arrow (pointing in a small box) means that the content can be downloaded. A trash can means that the file is already stored on the smartphone. A tap on the icon deletes the file. A red, crossed-out circle means that the file can not be downloaded. The most common reason is too little free space on the smartphone. Delete old files or applications that you no longer need. I have downloaded all the files available, and yet they are grayed out as unavailable in the file manager or App. You can try deleting all files and downloading them again. Keep the app open during the download and wait for the green tick to appear. 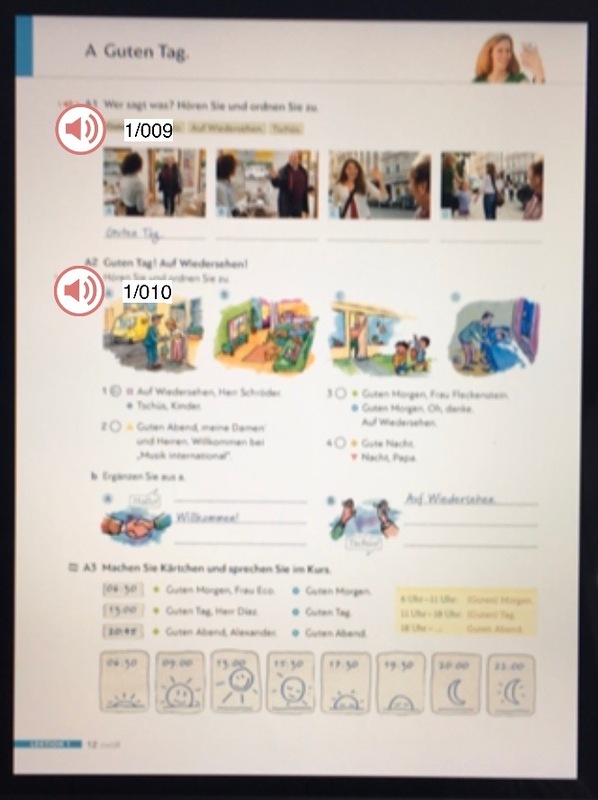 The Augmented Reality (AR) App created by the Hueber Verlag will scan a page in a book and show you the audio tracks and videos that you can then play using the audio or video buttons that the App provides. For the App to work well you need good lighting - please avoid glare, reflections, dim light and shadows. Always scan the whole page starting at the top - taking just a section of the page will not suffice - and make sure the page lies as flat as possible. Pages with photos and pictures will be recognised more quickly and reliably than pages without photos or with illustrations of poor contrast. Using the download manager (gear-wheel icon) you can download all the media not already present on your device. Thereafter an internet connection is no longer necessary. Remember that the relevant media are activated via the scanning process on each page. Downloaded audio tracks and videos can be deleted from your device at any time and reinstalled at a later date. The App does not respond: depending on your device's configuration in certain cases the App may not activate after installation. Should this occur, please turn the App off and start it again. The audio icons appear only in a grey colour and cannot be activated as they are not yet installed on your device. Tap on the gear-wheel icon and open the download manager. You can now download the audios onto your device. I would like to pause the playback of an audio or video file and then continue, but must always start over again. This is a feature request we have already received more often. We have included it and the implementation will be prioritized as the app evolves. So the feature should be available in one of the upcoming updates. When I scan a page with the AR app, the sound and video icons on the page flicker extremely so I can not touch them. Sometimes the audio and video icons in the AR view on a book page flicker strongly. 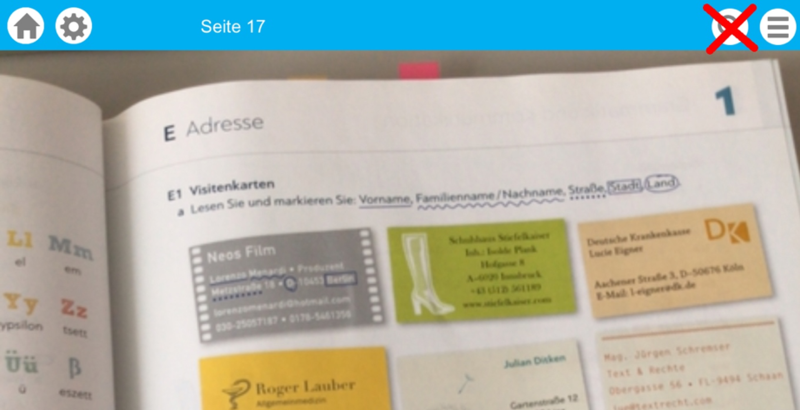 This can happen if the app does not clearly recognize a page, e.g. there is no image on a page. Or the whole page is designed with little contrast. In such a case, try to keep the camera slightly farther away from the book page. The display of the icons will then mostly stable. It is common that at the beginning, when a page is recognized, the icons first "search" for their place, when they have fiddled with it, they also remain stable, even if you approach the page again with the phone. Audio and video buttons are displayed but no sound is heard when playing. Make sure your device is not set to "silent" or "undisturbed," or the sound is just too low. 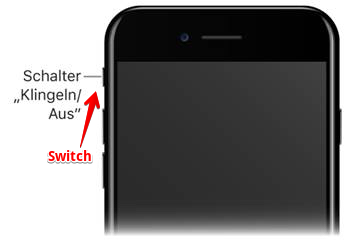 Some devices - iOS and Android - have a switch on the device. For other devices you have to do this in the operating system settings. 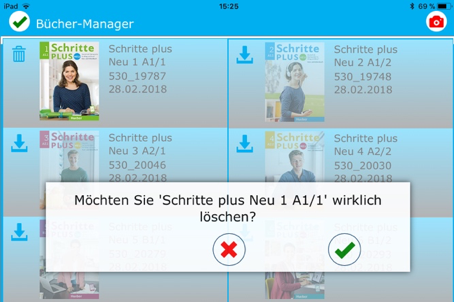 Die wichtigste Neuerung der App: Durch Eingabe der Seitenzahl kann man nun auch ohne zu scannen auf die Medien einer Seite zugreifen. Damit steht ein alternativer Medienzugang zur Verfügung, wenn eine Seite beim Scannen nicht erkannt wird. Und alle neuen Apps, welche zukünftig erscheinen werden. Abb. Meldung, wenn neue Updates verfügbar sind. 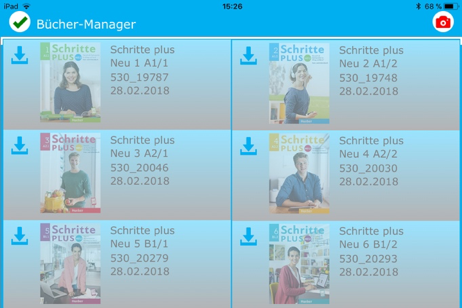 Im Hintergrund wird nun die Liste der verfügbaren Bücher geladen und der Kunde wird nach Abschluss des Ladevorgangs auf die Seite vom Büchermanager geleitet. Wird der Ladevorgang hier abgebrochen, kann der alternative Medienzugang nicht genutzt werden. Die Lupe erscheint nicht. Wird der Ladevorgang bestätigt, kann die neue Funktion genutzt werden. Bei diesen Vorgang werden die Daten noch einmal vollständig neu geladen. 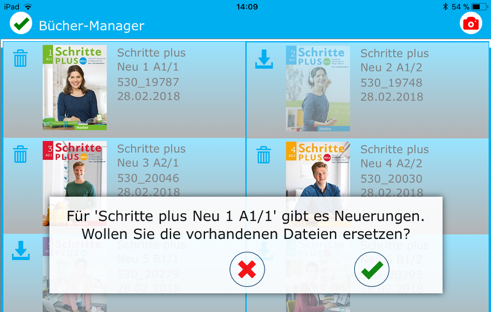 Um das mobile Datenvolumen nicht zu verbrauchen, empfiehlt sich eine WLAN-Verbindung zu nutzen. 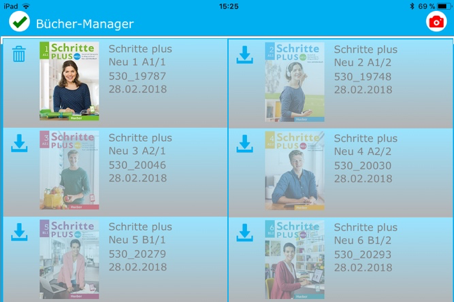 Für alle Kunden, die sich die AR-App ab dem 2. März neu installiert haben, treten keine Probleme auf. Bestätigen Sie jetzt den Ladevorgang. Nach Beendigung steht dann die neue Funktion zur Verfügung. und laden Sie es neu (3).